TWO former Henley Hawks players will set off on a 650-mile cycle ride in memory of a team mate on May 27. 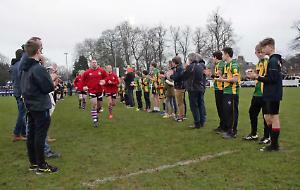 Simon Perry and Tom Allen are undertaking the six-day challenge in honour of former fly-half James Comben, who lost his fight against cancer in August last year, aged 29. The pair, who played with Mr Comben for a total of more than 14 years, will visit 19 rugby clubs en route. They hope to raise £10,000 for the Bloodwise leukemia and lymphoma charity, which supported their friend and his family. So far, they have raised £4,345, including £600 from Mr Comben’s parents. Their route will start in Redruth and go as far east as Canterbury before returning to Henley Rugby Club for a large group cycling event on June 1. The pair will be joined by Mr Allen’s brother Anthony, a former Leicester Tigers and England centre, with other players making guest appearances. Mr Comben was diagnosed with T-cell lymphoblastic lymphoma, a rare type of blood cancer, in February last year while recovering from an injury. He underwent two bouts of chemotherapy and had hoped for a bone marrow transplant from his sister but was told by doctors that the disease had spread and was incurable. Mr Comben, who wrote about his fight with the disease in an online blog, married his partner Elle shortly before his death.